"Get ready boys and girls!! 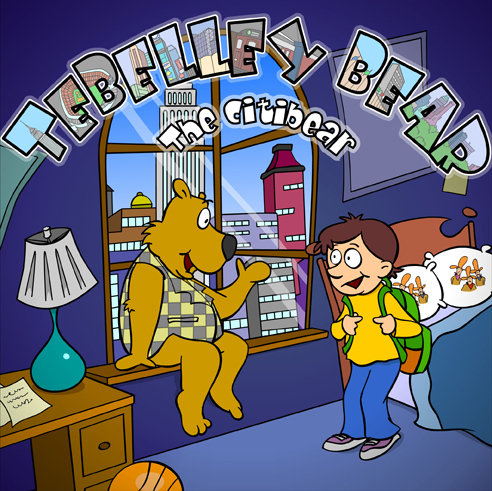 You are about to join TEBELLEY BEAR - THE CITIBEAR in his next exciting adventure!!" Just like that, Tebelley Bear along with his trusted young friend and comrade, Joey Roberts, set off an another adventure in the most exciting city in the world - New York City. I’m sure you would agree, a city like no other deserves a bear like no other. That’s why New York City has Tebelley Bear! Tebelley Bear is known far and wide as New York City’s "Hero Bear". So just who is Tebelley Bear? To find out more . . . you are just going to have to listen to Tebelley’s famous audio stories prepared just for you! So you think you already know all about Tebelley Bear? Did you know he lives with Joey Roberts on the 26th floor of a very tall apartment building smack dab in the heart of New York City? Did you know Tebelley’s favorite spot in the whole wide world is sitting on the window sill in Joey Roberts’ bedroom? Did you know Tebelley Bear can spend hours looking out of Joey Roberts’ bedroom window at all of the action that goes on in the skies above and on the streets below in New York City? Now you probably knew there is one man in New York City who is always looking to cause all kinds of trouble. He is so mean! You guessed it . . . that’s why they call him Meano Greeno. How is it that he always seems to escape from jail and cause all kinds of trouble? Have you met Tebelley’s other friends like the "Man at the Door" who is VERY smart and also helps the Tebelley Bear with his plan of action? Did you meet Frank the Cab Driver, the wiseacre cab driver with a New York edge who often chauffeurs Tebelley Bear and Joey Roberts to the scene of the action. Any real Tebelley Bear fan knows that Billy Bob John and his Posse - Shootin' Tootin' Sam, Wrangling Russel, Cajun Jim love nothing better than to catch Meano Greeno their own way - with great western flair and flavor. Once they, miraculously POP off Joey Roberts’ pillow case there’s no telling what might happen!